Introduced in 1991 with the 964 Carrera RS model, Ruby Stone Red is a bold factory color that goes against the stereotypical Porsche owners style. 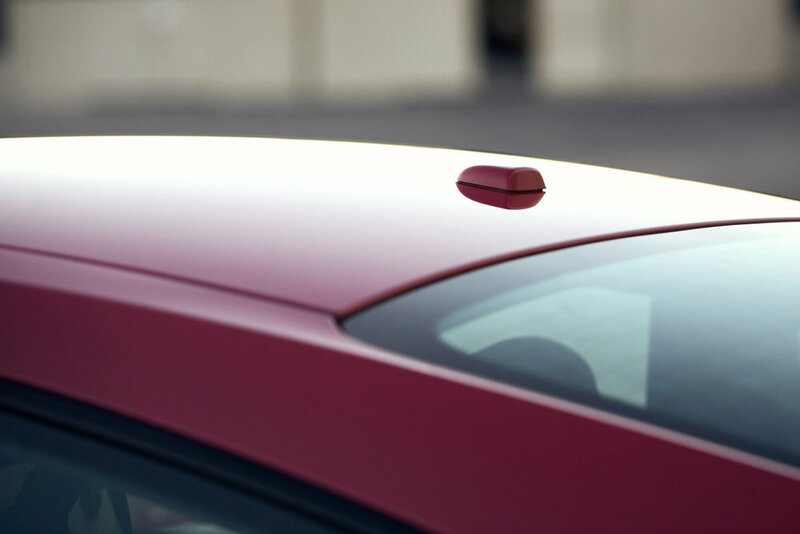 For the 991 era, Porsche renamed Ruby Stone to Ruby Star as one of the paint-to-sample color options, which happens to share the same color code as the original Ruby Stone Red - 82N. Additionally, the original german name for the color was “STERNRUBIN” which in direct translation is Star Ruby. The owner of this Ruby Star 991 mk2 GT3 opted for our RXX option list to be even more adventurous. 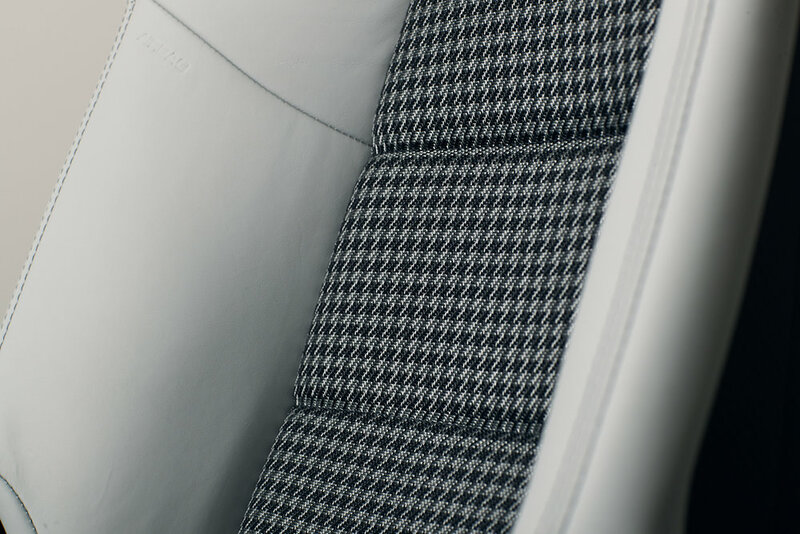 The interior received our in-house fabricated seat inserts, with a fabric choice that mimics classic Porsche Jubilee in the 80’s - but with a modern twist and the color to match Ruby Star. Our protective leather bolster covers were also fitted to the lightweight buckets, in addition to color matched harness belt passages. The standard black seat belts were changed to custom made Wine Red to further enhance the color scheme. To complete the Ruby Star theme, the standard black headlight washer nozzles & satellite radio antenna were also color matched to the body. To see more images of this 991.2 GT3 along with the full build list, please visit the gallery here. This is just a small sample of what is available on the RXX option list, please contact us below for specific details on how we can help with your build. 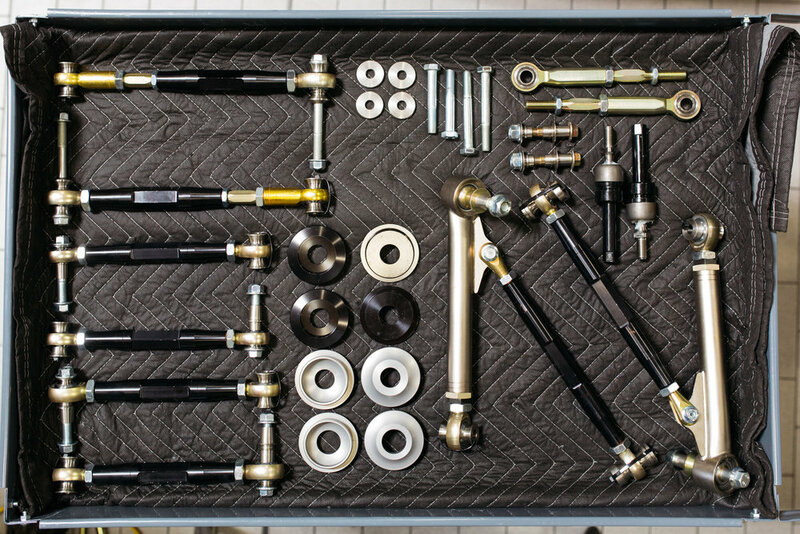 The last installment of the aircooled 911s featured a newly revised rear suspension set-up engineered by Porsche. 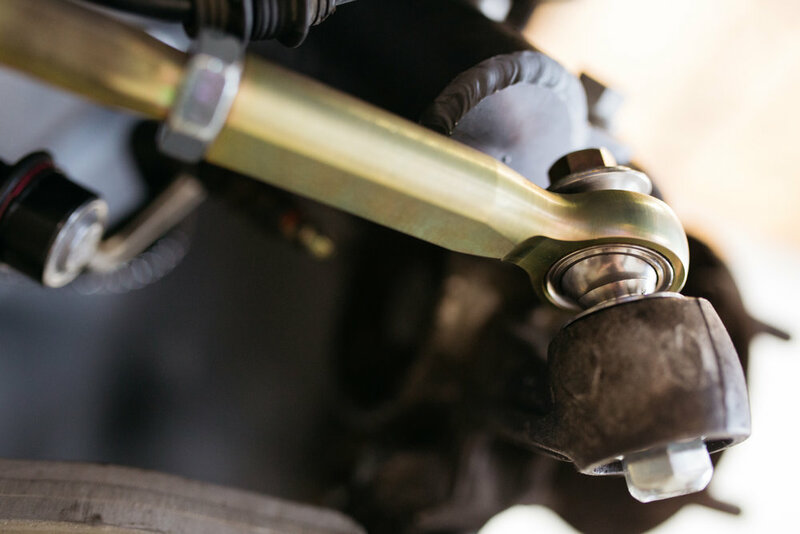 While this 5 link rear suspension vastly improved the handling characteristics of the 993 over the predecessor 964 weissach axle, enthusiast 993 owners felt the suspension to be too soft. 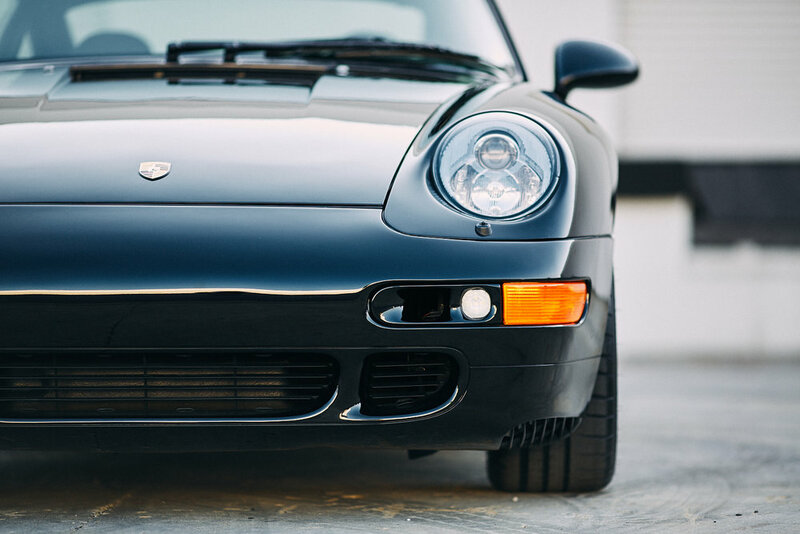 By request, our client requested more out of their 993, enter our RXX option list. 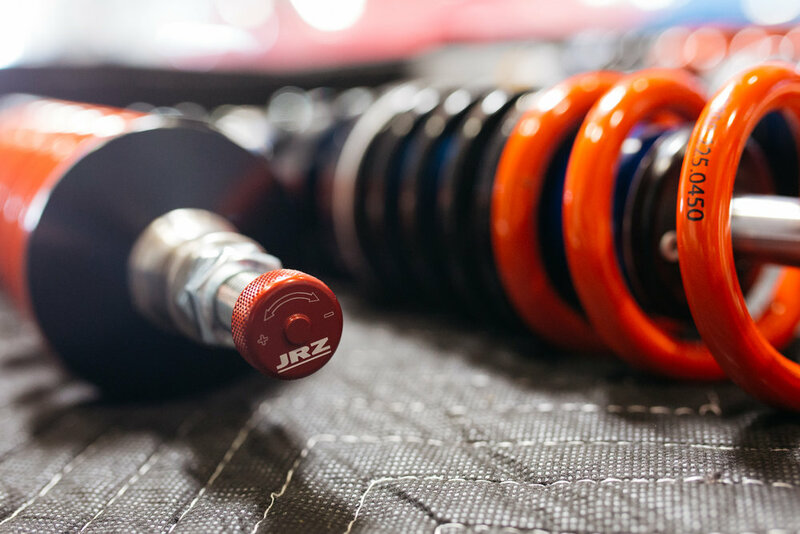 We improved on every corner of the 993 suspension by installing JRZ RS coilovers, replacing rubber bits everywhere with heim joints and spherical bearings and fine tuning the suspension alignment to make this car feel as if it’s riding on rails. 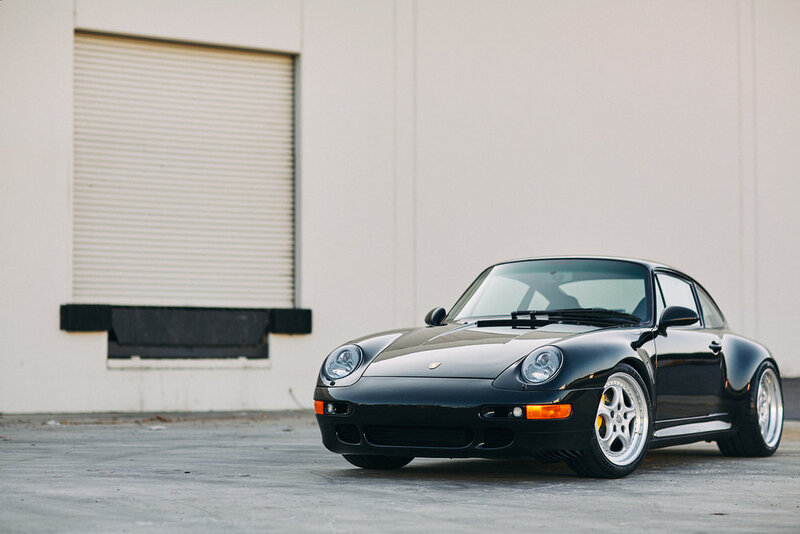 The 993 also received several favorable OEM Carrera RS parts that included motor & transmission mounts, sway bars, end links, and strut tower brace. To help upon the stock shifter slop we installed the FD Motorsports short shift kit and golden rod. 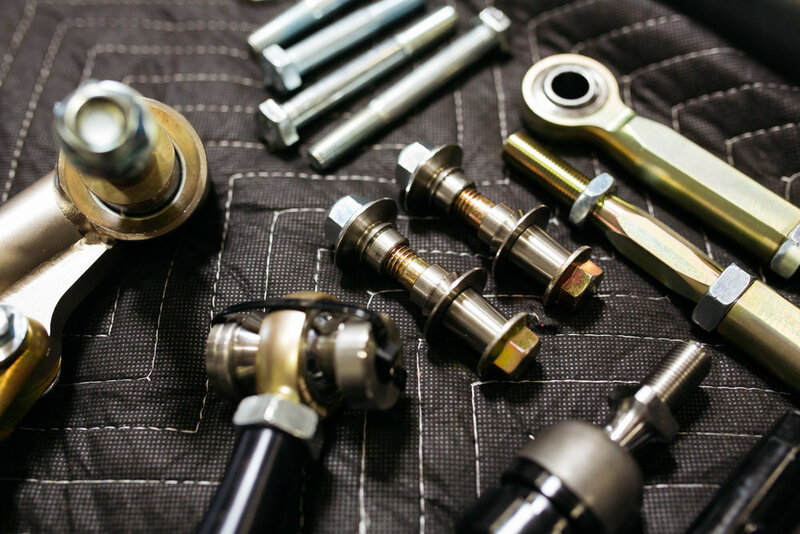 The entire 5 link rear suspension along with the rear subframe mounts were refinished with ERP parts to eliminate any rubber play in the rear. ERP adjustable kinematic links, camber links, toe steer and rear lower control arms were also fitted. 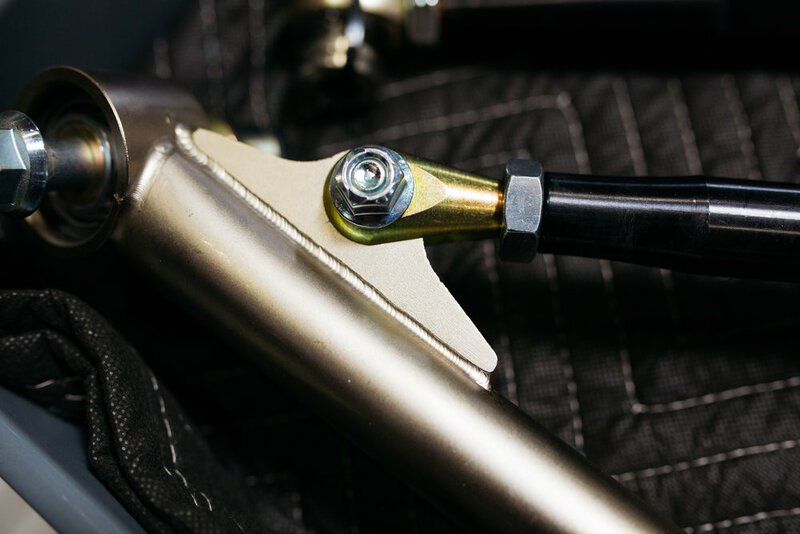 The front suspension was treated with refurbished control arms that were fitted with Elephant Racing spherical bearings to replace the OEM rubber ones and further complimented with fresh ball joints. 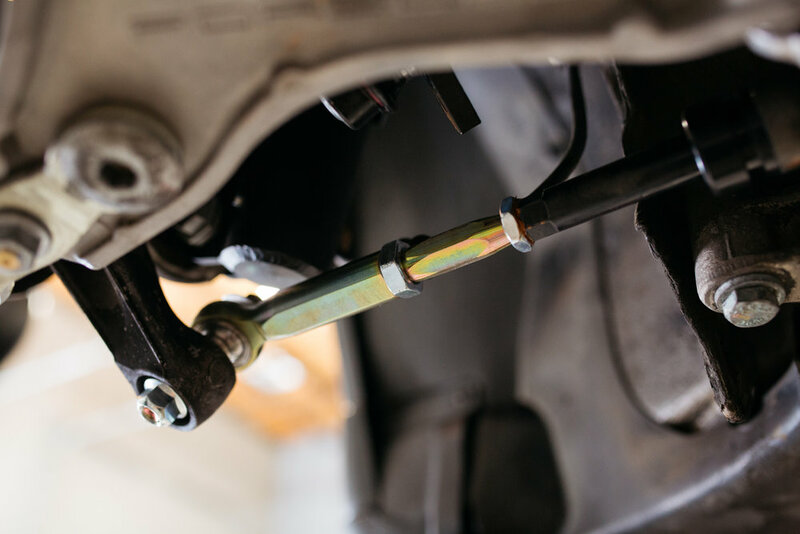 The steering rack was enhanced with the ERP bump steer tie rod kit. 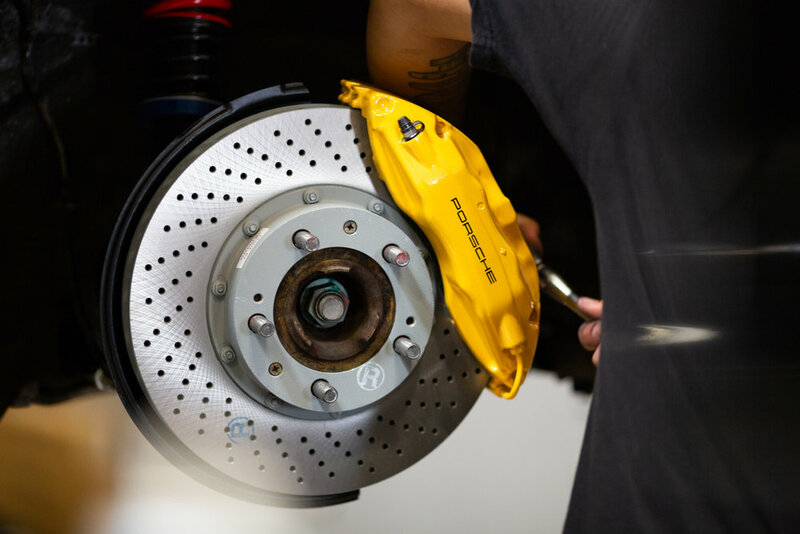 After the complete suspension overhaul was finished, we then took to improving braking by installing the Porsche big red brake kit refinished to OEM yellow. 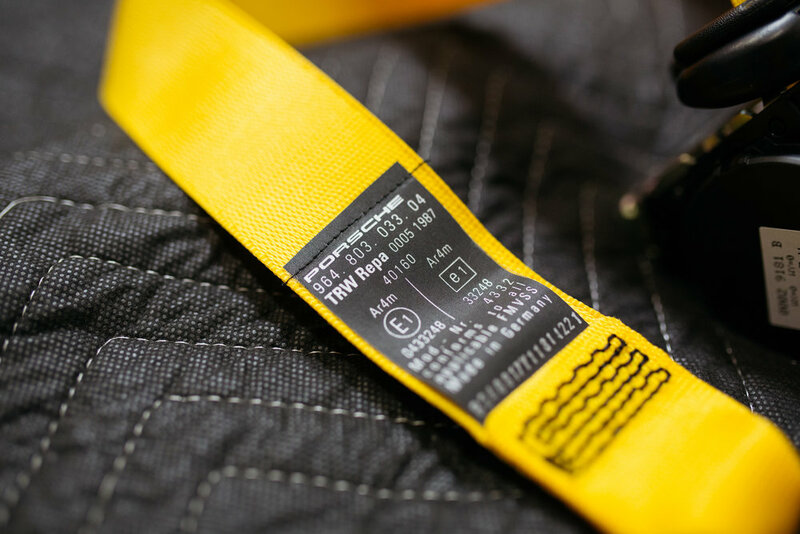 In-house fabricated RS door cards were installed featuring OEM Carrera RS door pulls and seat belts to keep the yellow theme going. The front fog lights units were exchanged for Turbo S cooling ducts with LED lights to help keep this car running cooler. After setting the ride height to Carrera RS spec the bump steer in the front and rear of this car was finely tuned to get the most of the every upgrade. To further the RS theme, the owner opted for 3 piece Tramont Cup 2 wheels with a deep dish and aggressive fitment. 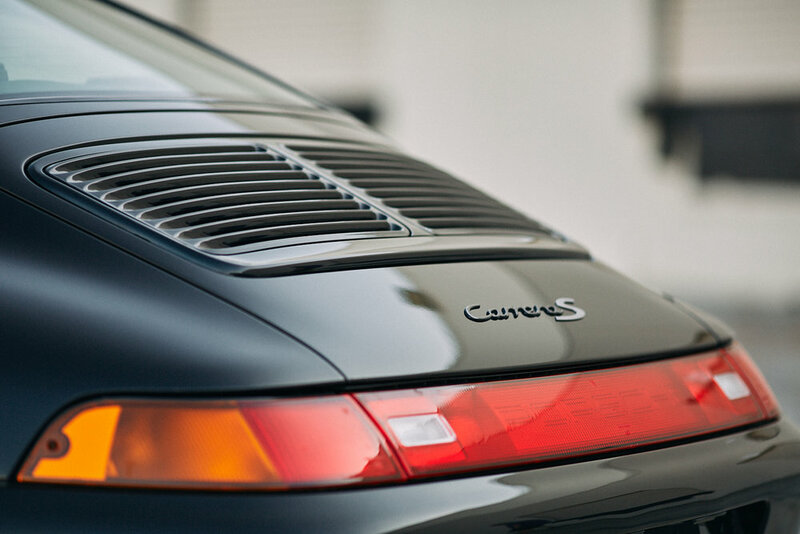 To see more images of this 993 C2S along with the full build list, please visit the gallery here. Please contact us to discuss how we can help refresh your personal project. 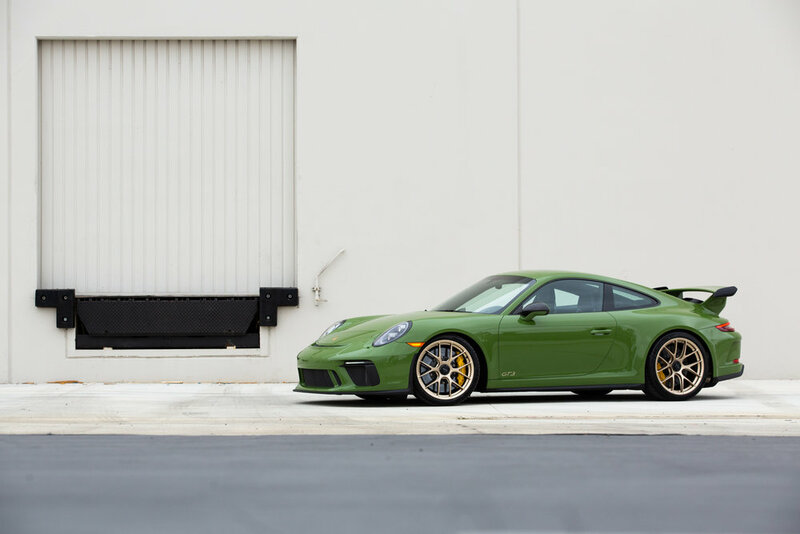 While the option list when ordering any Porsche may seem overwhelming, some of our clients request something even more. Enter our in-house RXX option list. 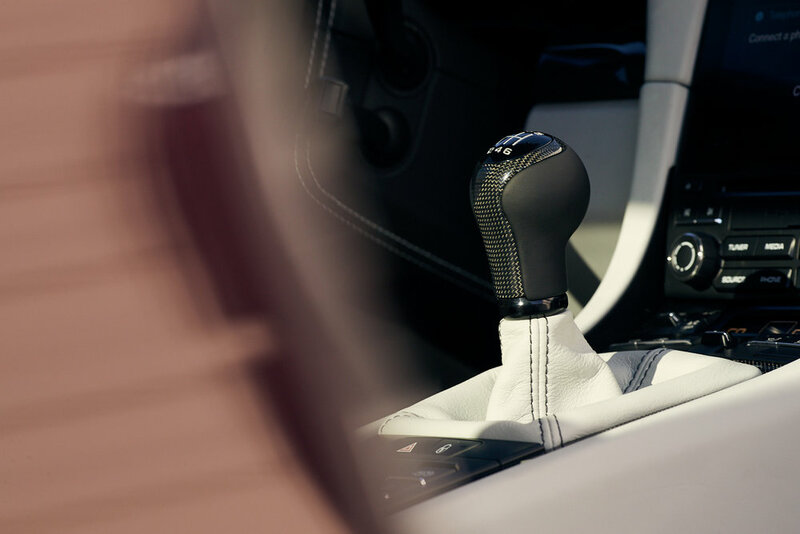 With a similar philosophy to the original Porsche Special Request Programme aka “Special Wishes”, the RXX option list allows for exclusive tailoring of both interior and exterior components beyond that of the factory. 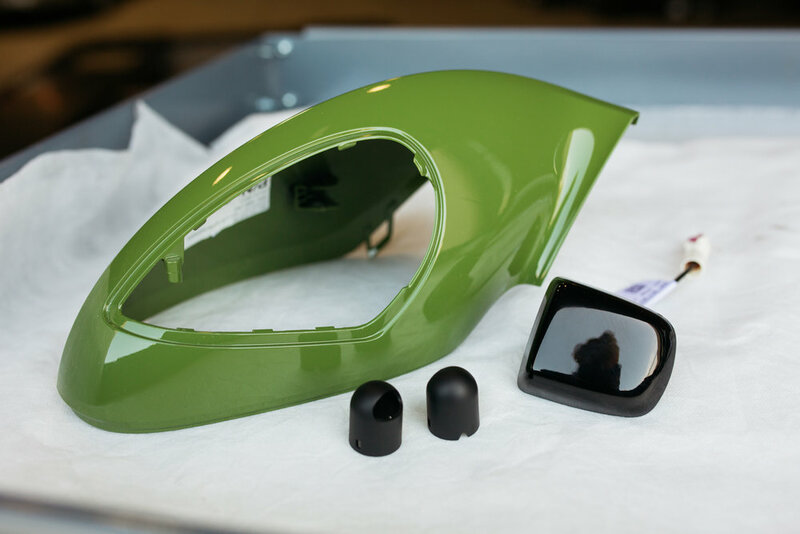 After taking delivery of a new 991.2 GT3, our client opted to swap the color matched olive rear view mirrors with black bases with genuine Porsche carbon fiber mirrors and color matched olive bases. 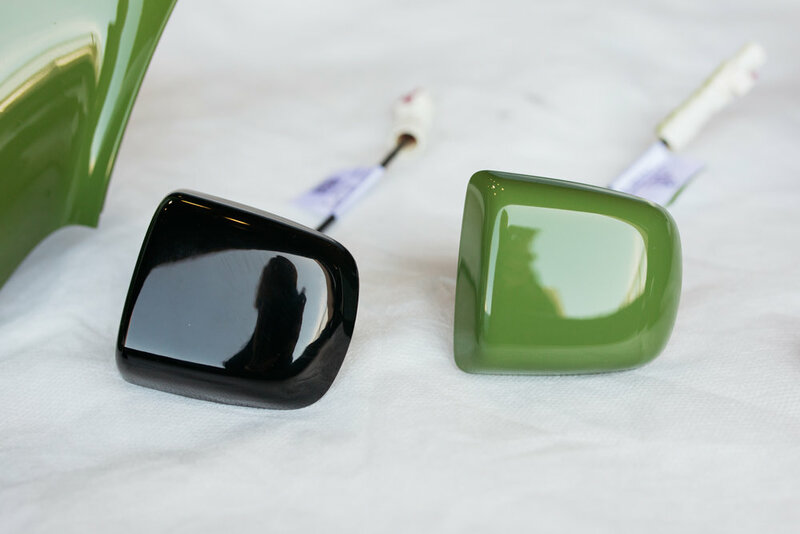 The standard black headlight washer nozzles and radio antenna were also replaced with color matched olive trim to appear more subtle on the body. The standard OEM center lock wheels were also replaced in favor of Forged magnesium monoblock BBS wheels. Originally delivered in satin titanium, the wheels were custom finished with a more muted white gold and wrapped them with Michelin Pilot Sport Cup 2 tires. To further this olive/white gold color scheme we added color matched GT3 door stickers and rear badge.